Blood tests are important diagnostic tools. They accurately tease-out vanishingly small concentrations of proteins and other molecules that help give a picture of overall health or signal the presence of specific diseases. Current testing procedures, however, are expensive and time-consuming, while sophisticated test equipment is bulky and difficult to transport. Now, a team of researchers from the University of Toledo in Ohio has addressed all these drawbacks by developing a low-cost, portable technique that is able to quickly and reliably detect specific proteins in a sample of human blood. This innovative technique, described in the Sept. 1 issue of the Optical Society‘s (OSA) open-access journal Biomedical Optics Express, could help in a wide range of medical sensing applications, including diagnosing diseases like cancer and diabetes long before clinical symptoms arise. Human blood contains literally thousands of different proteins. Many are essential for the day-to-day mechanics of life. Others are formed only in response to certain diseases. Knowing which protein is the hallmark of an illness and singling it out of a blood sample leads to earlier diagnosis and more effective treatment. An example of this is the prostate-specific antigen (PSA), which is now routinely tested for to help detect prostate cancer and other prostate abnormalities in men. In this new system, the researchers borrowed a trick from nature, using artificially created molecules called aptamers to latch on to free-floating proteins in the blood. Aptamers are custom-made and commercially available short strands of nucleic acid. In some ways, they mimic the natural behavior of antibodies found in the body because they connect to one type of molecule, and only one type. Specific aptamers can be used to search for target compounds ranging from small molecules — such as drugs and dyes — to complex biological molecules such as enzymes, peptides, and proteins. Aptamers, however, have advantages over antibodies in clinical testing. They are able to tolerate a wide range of pH (acid and base environments) and salt concentrations. They have high heat stability, are easily synthesized, and cost efficient. 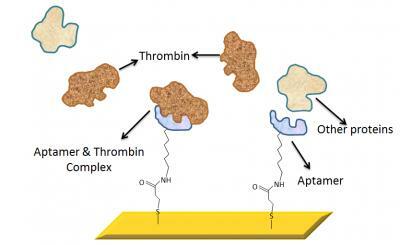 For their demonstration, the researchers chose thrombin and thrombin-binding aptamers. Thrombin is a naturally occurring protein in humans that plays a role in clotting. The researchers affixed the aptamers to a sensor surface, in this case a glass slide coated with a nanoscale layer of gold. As the blood sample is applied to the testing surface, the aptamer and their corresponding proteins latched together. The next step is to actually determine if the couples pairing was successful. To make this detection, the researchers used a real-time optical sensing technique known as Surface Plasmon Resonance (SPR). A surface plasmon is a “virtual particle,” created by the wave-motion of electrons on the surface of the sensor. If the protein is present and has bound to the aptamer, conditions for which resonance will occur at the gold layer will change. This resonance change is detected through a simple reflectance technique that is coupled to a linear detector. “By monitoring these conditions, we can quantify the amount of the target protein that is present; even at very low concentrations,” says Cameron. “This approach is very robust in that unique aptamers for almost any given protein can be identified. This makes the technique very specific and adaptable for any given application.” The approach also requires less-bulky optics, which is the key to the portability aspect of the design. Aptamer sensors, according to the researchers, are also capable of being reversibly denatured, meaning they can easily release their target molecules, which makes them perfect receptors for biosensing applications. “The advantage of this surface plasmon sensor,” says Cameron, “is that it enabled us to demonstrate low sample consumption, high sensitivity, and fast response time.” The direct detection of blood proteins in this manner can benefit a number of scientific and clinical applications, such as monitoring diabetes, drug research, environmental monitoring, and cancer diagnosis. For commercial use in medical diagnostics, according to Cameron, the technology is three to five years away, pending FDA procedures and filings. “The time frame is very dependent on the target application area. We are currently in the procedure of determining suitable aptamers for a range of target proteins for both diabetic and cancer-related applications,” he says.